The jobs market is recovering slower than expected, and so is housing. But neither condition has slowed U.S. consumers. According to the Census Bureau, Retail Sales rose for the 11th straight month in May. 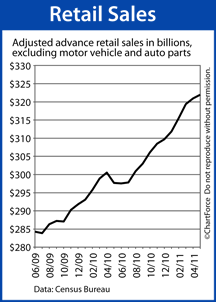 Excluding cars and auto parts, sales receipts climbed to $322 billion last month. It’s an all-time high and another example of the U.S. economy’s resiliency. Wall Street didn’t expect such results. As a result, mortgage rates worsened Tuesday. The connection between Retail Sales and mortgage rates can be fairly tight in a recovering economy. Retail Sales accounts for almost half of all U.S. consumer spending, and nearly one-third of the economy overall. The May report, therefore, showed the economy may be on more solid footing than economists expect. Plus, lately, as the economy goes, so go mortgage rates in Nashville and nationwide. When the economy has shown signs of life, mortgage rates have increased. When the economy has shown signs of a slowdown, mortgage rates have dropped. It’s why mortgage markets reacted the way they did Tuesday; May’s Retail Sales data was strong. The resultant surge in conforming mortgage rates — from market open to market close — turned into one of the year’s fiercest, raising average mortgage rates well off their 7-month lows established earlier this week. At today’s rates, each 0.125 percent change in rates yields a payment difference of $7.50 per $100,000 borrowed. Yesterday, some product rates rose by as much as 0.250 percent. It put a dent in home affordability and household budgets. With Retail Sales are up 8 percent from last year, therefore, and showing few signs of a slowdown, today may be a prudent date to lock a rate with your lender. As the economy continues to grow, rates are expected to rise.